I took a train ride for the first time in Auckland for many years, from the shiny Britomart Station (pictured left) all the way south to Middlemore Hospital. It was just after rush hour (18:26), and the train was surprisingly rather empty, perhaps 20 people in our carriage, which could easily hold 200. The system (map) has been ramshackle from its origins and for many decades neglected in favour of road building. Lately they are upgrading the network, but it's still diesel locos and narrow in and out to Britomart, which is a major bottleneck preventing an expansion of the number of services into this station. Why do engineers only build for the present and never for the future? Anyway, a longish tunnel out and then a swing into Parnell up to Newmarket. Quite a long distance, there really should be a Parnell Station for the suburb and a bridge to the university if they ever want to up ridership. The train goes remarkably slow - slower than the London Underground, I reckon. And there is a train conductor too, who collects fares and decides when doors open and close and when the train starts rolling again. Of course, this being un-integrated Auckland, my Fullers monthly pass for ferry and some bus services is certainly not valid on the train. It'll be a good time before we get anything like an Octopus or Oyster card (our version is going to be called "Hop Card" - but don't hold your breath that it will include Waiheke). The fare was $4.10 for about 30-minute ride over 16km. Not a bad fare considering we pay $17.50 for a 40-minute ride over 22km on the ferry - especially since train infrastructure of rails, stations, land, electrification, rolling stock sounds to me more expensive to set up and run than a ferry terminal and a couple of ramshackle boats. 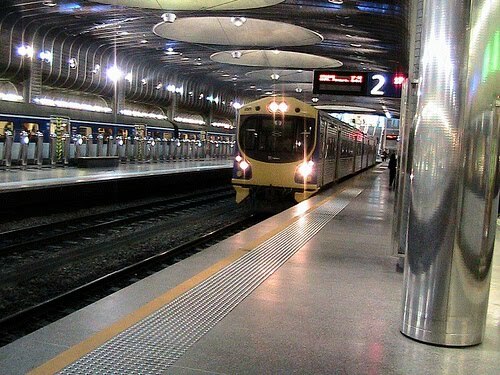 Middlemore Station is very conveniently located when you want to visit the hospital or attend the local schools (we were invited to a Xmas function at King's College). But the other stations like Remuera, Penrose, Westfield or Otahuhu are really in the middle of nowhere, or rather in an industrial wasteland - pointing to the original purpose of the Auckland rail network: goods transport to and from the industrial zones to the port and the hinterland. It was never conceived or designed as a passenger network, and I can't really see how they are going to get the stations closer to homes and businesses where people actually want to travel. If you're going to town for the day on Fullers, it pays to book your day return ticket online (not available on peak days and certain weekends) because there is s substantial discount on the standard return fare. When you have finished your booking the note at the end of the print out says that tickets need to be picked up before 5pm at Matiatia, but this is actually incorrect. Jim Hannan told my partner that the Matiatia ticket office stays open until 6.30pm. So no rush. Now if they could tackle the issue of the expensive surcharge on tickets sold on the wharf after that time due to the office being closed. The un-announced use of the JetRaider on the Waiheke run yesterday (QuickCat on charter) saw the 5:00 sailing leave ten minutes late. The Lass on the tannoy announced that they would be going as fast as possible to make up the time. I guess she forgot to tell the skipper as he dawdled down the harbour at 19 knots. Finally managed to get a beer by Emu point and it was warm. The final result was 18 minutes late in the door. Fullers – Fail. It apparently got even worse later in the evening when SuperFlyte "lapped" JetRaider and the whole timetable for Friday night went out the porthole. There is always a sense of foreboding when a cellphone text message comes in from Fullers. What sailings will be cancelled, late or replaced? What boats have sunk? Has the Wanderer been hijacked by pirates off Motutapu? Yesterday it was to say that old lady Quickcat was off for "unplanned maintenance". No indication for how long she will be off or what was wrong with her. "Unplanned maintenance" is Fullers-speak for a cover-all of all sorts of technical mishaps, and judging by past experience these outages can be quite lengthy. On the 8am Waiheke to Auckland sailing on 12 November 2010, Fullers emptied the sewage tanks in the Gulf. I have been in email contact with Mike Lee who has in no uncertain words told the contact at ARC that the pump out facility was put in at taxpayers' expense in 2005 and Fullers are meant to be using it. The Harbourmaster pollution officer and Fullers are to be contacted about the matter. UPDATE: Fullers have come back to ARC and advised that they did not empty the sewage tanks and say that it must be a problem with their venting system and will have to investigate. The intensity was the same as if they were emptying the tanks so they have a problem. A joint initiative with the Auckland Regional Transport Authority, North Shore City Council, Bayswater Marina and Fullers ferries has opened up free parking at the marina for ferry commuters. Transport authority customer services general manager Mark Lambert says free carparks for ferry users are available on weekdays. "Taking the ferry from Bayswater to the city just got easier. "It's a relaxing journey and it only takes 15 minutes into the city – and now passengers can enjoy the free parking at Bayswater Marina," he says. Newly elected Devonport-Takapuna Local Board member and Shore councillor Chris Darby says ferry users now have access to 165 carparks at the marina. He says the transport authority's access agreement with Bayswater Marina will boost efforts to decongest Lake Rd and improve ferry patronage. "It's a big win for ferry users and is one of the many ingredients of the Devonport Peninsula Travel Plan, a multi-pronged initiative to alleviate congestion on Lake Rd," he says. Mr Darby says smart solutions like this combined with incremental improvement in other areas compound into making a significant difference. Spaces are available on a first in, first serve basis. Ferry patronage for September is -2.4% (8,199 boardings) lower than last September, for the financial year to date patronage is down by -0.4% (4,106 boardings) compared to the same period in the 2009/10 financial year. In September 2009 a promotion was run whereby a number of ferries offered free travel, resulting in a patronage increase of 7.6% for that month. Although ferry patronage this September is down on the September 2009, it has increased by 5.1% over the last two years compared to September 2008. Of course, this is for all ferries in Auckland, not just Fullers or the Waiheke service although I suspect that we make up the bulk of the overall patronage. Please check the monthly graph in the report (page 8) for a historical comparison going back 4 years. The Winter months seem to have a bedrock of 300,000 commuter movements a month, topped up by 150,000 tourist movements a month over Summer. But it doesn't seem to vary much year after year. Perhaps the ferry breakdowns over Winter cause the dips, blows softened by fare promotions (but not for everybody). In August 2008 we did research into various ferry fares around the world. So we are now doing an update and comparison over 2 years later. The Waiheke ferry is still up there among the most expensive in the world, not really a change there. Note that the $344 August 2008 fare was brought back to $310 in January 2009 and then increased to $315 until the recent rise to $330 in October 2010. What has changed is an increase in the number of integrated ticketing systems available for all transport modes within a geographical region, something we are still waiting for in Auckland. Notes: All prices are for monthly passes and ferry travel only, unless stated otherwise. The exchange rates are at Aug 2008 and Oct 2010. Passengers taking Auckland’s public transport have increased again - with the total number of passenger trips for the month of August being 7.8% higher than August last year, with bus up by 7.0%, rail up by 17.2% and ferry down slightly by 1.3%. Ferry patronage for August is -1.3% (4,300 boardings), lower than last August, for the financial year to date patronage is up by 0.7% (4,822 boardings) compared to the same period in the 2009/10 financial year. No surprises here: August was a particularly bad month operations-wise for Fullers with Quickcat out on survey and Superflyte out of action for mechanical reasons. The patronage fall taken together with the selective discount for September passengers (monthly pass holders only) makes it unsurprising too that Fullers needed to rack up fares in October under the GST increase fig leaf. The result of the local board elections doesn't bode too well for public transport users, since Waiheke has opted for mainly rightwing candidates - including a Fullers employee. Thankfully both the Mayor and our new Auckland Councillor, Mike Lee, will be able to, through the Transport CCO, sort out the expensive mess on the Waitemata. But only if our new Proconsul Mark Ford can be made to. 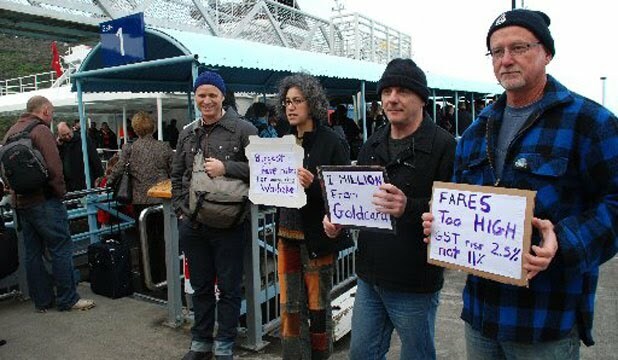 This morning a small contingent from the Campaign 4 Fair Ferry Fares protested the 1 October fare rises by Fullers at the Matiatia wharf. Waiheke Board candidate Ewen Sutherland (right) joined the protest and Waitemata Council candidate Alex Swney (not pictured) looked on in sympathy. A Waiheke Marketplace journalist was in attendance. The NZ Herald picked up on the issue too. Pity they swallowed Fullers' spin wholesale. Another concern which the island should be debating is our ferry services. Despite relatively high fares the island has had in general pretty good service from Fullers, the company founded by the visionary George Hudson in the 1980s. However with the long periods out of service of the QuickCat, SuperFlyte, the realisation is dawning that along with the Jet Raider these vessels are now past the expected economic life of a ship. And given that the recent owners’ (Infratil and now Scotland-based Brian Souter) main objective has been to extract as much profit from the Waiheke run as possible, there are no signs of interest in investing the significant amount of money needed to buy new ferries to cater for Waiheke’s needs for the next 20 years or so. This should be a major concern for Waihekeans. We have some choices. We could lobby the Auckland Council and request that the new Auckland Transport Agency buys out Mr Souter and takes over Fullers. Or failing that we should think about as a community buying a new vessel ourselves. The new vessel or vessels could be owned by a Waiheke residents’ Trust and could even be run by a management company in turn also owned by such a trust. Or we could get Fullers to operate under a management agreement. I would also like the Rakino service currently run on a limited basis by Pine Harbour Ferries for a very handsome ARTA subsidy to be run as a regular twice a day feeder service to Matiatia and be run by a Waiheke or Rakino-based business. I am open to ideas and would like Waiheke residents to think seriously about this issue. Worth your vote, I reckon! As expected, Fullers will put up fares from October 1 and is using the Government-mandated GST rise of 2.2% to rack up its fares by 4.7% (for commuters and 40-ride tickets) just because it can, so it does and will do again. The new fare structure is here. Again we are being gouged after several years of increasing fares more rapidly than the CPI, without any accountability or redress in line with its monopolistic position in the market and a feeble regulatory regime. It again is a stark reminder of why we are here and we cannot afford to go away or lie down. UPDATE 23 September: So far I cannot find on Fullers website any planned changes in fares on Fullers ferry routes other than the Waiheke one. A vindication of a tendered contract perhaps that doesn't allow at-will price hikes on subsidised routes? It would reflect the urgency of taking the Waiheke route into public ownership for the good of all Aucklanders, not just Waihekeans. Pity the poor students being whacked by a 11.1% in their 10-ride tertiary ticket. But at least their dogs will now ride for free. UPDATE 24 September: A commenter pointed to Sea Link (the freight and car ferry company) upping its fares too. Return tickets go from $30 to $32 (up 6.6%) and monthly passes from $275 to $290 (up 5.45%). Waiheke Shipping, its rival company on the Half Moon Bay run, is keeping its passenger fares as they were before 1 October. On the mainland, Maxx has announced a bewildering array of fare changes on buses and trains. Fullers: We'll Take You There Out. The Campaign for Better Transport, Cycle Action Auckland, Living Streets Aotearoa and Walk Auckland have set up a co-ordinated website covering all aspects of mobility across the new Auckland City: it will quiz the new Council on various projects covering trains, buses, walking, cycling, ferries and cars. You can make suggestions on the projects there and we'll keep an eye on the ferry system proposals. There was an interesting letter in the Gulf News this week from a student commuter who was unimpressed with Fullers' gushing apologies and compensation for the commuter hardship experienced last month. It offered a $50 discount on monthly passes for September but forgot to mention in its PR spin that all other tickets and season tickets (including tertiary passes) would be full price as per usual. No explanation was given by Fullers why only adult monthly passes were discounted. But my guess would be that line of action was basically to shut up FUG members. Divide and rule is still the best tactic for monopolists. A general fare increase is still on the cards for October, thinly disguised as a Government-mandated GST increase, despite a bumper revenue year (what with the millions in Super Gold Card loot) and cheaper diesel. Waiheke Radio has created pages to interrogate candidates for this year's Local Board elections. You can leave questions for them to answer, or make even general commentary on their candidacy. Great initiative, so ask them about Waiheke transport! Fullers just texted me stating both Superflyte and Quickcat are out of service for the next three weeks and all commuter runs will be done by JetRaider and Starflyte. With the rather painful addendum to the text: "please note limited capacity". Oh joy, three weeks of choice between the experience of a real live sheep shipment or a packed sardine! And if you think it feels like groundhog day on the ferries, it is: year after year the same story of breakdowns, incompetence, under-investment and customer gouging. 18 August update: the 8am sailing from Waiheke on the tiny Starflyte left 15 minutes late and had to leave 25 people on the wharf due to lack of on-board space. Can we suspect Fullers putting up prices by more than 2.5% in October (for the GST rise) to "manage demand" down by upping fares so no more egg will appear on Fullers' faces? 29 August update: A fellow commuter told me the monthly passes for September are $50 cheaper as "compensation" for the inconvenience caused by the boat outages. Fullers have done this before, 4 years ago, only to be rapidly clawed back by the consequent fare rises. I expect something similar to happen this year: any fare rise higher than the GST increase will give you an indication of how quick it will go back to them. 30 August update: The $50 discount for September is only for people who have an August pass, not any other form of ticket such as worker's weeklies, 10 rides or 40 rides. 15 September update: The 5.30pm Waiheke sailing is delayed by 15mins due to an "unplanned maintenance requirement". Why do those Fullers txts always sound so ominously portending of worse things to come? This morning was one of those Wintry days when fog rolls into the Waitemata Harbour almost without warning. Jet Raider, coming from town ready to make the 8am sailing from Waiheke, had forgotten to bring a fog horn and a crew member capable of interpreting radar data, so Fullers sent an alert text notifying it had done a turnaround and gone back to town. The earliest sailing from Waiheke would be 9am, the laconic tannoy at Matiatia announced. Quickcat eventually left at 9.15am. Cue frantic cellphone calls and text messages from over 300 passengers waiting. Meanwhile, in Wellington the commuting hordes staged some civil disobedience by refusing to pay their train fare when their ride was cancelled. We are far too civilised on Waiheke to storm Fullers offices and demand a refund. That’s why we pay the highest commuter fares in the country. Moves towards national integrated public transport ticketing have taken a big step forward with the development of a key agreement between the NZ Transport Agency and ticketing system providers. The agreement paves the way for the creation of a set of national standards for integrated public transport ticketing. NZ Transport Agency Group Manager of Regional Partnerships and Planning, Dave Brash says a wide range of industry representatives are participating in the development of the ticketing standards. He says this is ensuring the best possible system for public transport consumers, transport operators, regional councils and the government. "We can continue to move forward co-operatively to progress the creation of National Standards by the end of the year," says Mr Brash. "It’s important that we are able to work well with ticketing providers to establish a scheme within the overall national framework which creates a fair and level playing field for all parties," he says. National operating standards define how the central core of a national system will function as well as how operator equipment such as on-board bus ticketing machines will interact with that system. "This standards approach will enable us to establish a long-term integrated national system that regions throughout New Zealand can cost-effectively link into," says Mr Brash. Auckland will be the first region in New Zealand to adopt the national integrated ticketing system and it is anticipated that other regions will follow. Mr Brash says national integrated ticketing is part of an overall strategy to establish a more efficient and effective public transport system. That is why it is a core part of NZTA’s leadership initiative in public transport. "It opens the door to contestability on transport ticketing equipment while ensuring the development of a cost-effective, nationally-integrated system." The new national ticketing standard is being developed by the NZTA in consultation with industry players including transport operators and regional authorities. Another big advantage of an integrated ticketing system will be the ability to easily collect common format strategic information about public transport usage. This will enable better long term planning and funding, which will result in a more efficient and cost-effective public transport system. The national standards process is being assisted by Dutch specialists, Collis, who have also been involved with the development of other multi-modal integrated card systems in Europe and Dubai. Organisations that are participating in the definition of the integrated ticketing standards are ARTA, Bus and Coach Association, Environment Canterbury, Electronic Ticketing Systems, Greater Wellington Regional Council, Init Pty Ltd, KiwiRail, Snapper, Thales, and HTS Group. You would think that, given the time it has taken to get this idea even this far, it is avant-garde and experimental rocket science. First the good news (but it will never happen here): Isle of Wight ferry cuts fares for NHS patient travel. Ferry passengers are to get reduced fares on services to and from the Isle of Wight if travelling to the mainland for hospital treatment. Foot and car passengers will receive a 50% discount on routes between Fishbourne and Portsmouth, Ryde and Portsmouth and Yarmouth and Lymington. The reduced fare will also apply to one person travelling with the patient, or two parents if the patient is a child. The scheme, funded by ferry firm Wightlink, starts on 21 June. Russell Kew, Wightlink's chief executive, said: "We recognise that we are an important lifeline for islanders. For some scary news (and don't count on it will never happen here): What if ferry fares doubled? When B.C. Ferries doubled fares in 1976 after sailing along at $5 per vehicle and $2 per passenger since the its launch in 1960 exactly 50 years ago today ridership plunged by more than 1.5 million passengers and 700,000 vehicles the next year. What if the fares doubled again? No biggie, according to the B.C. Ferries Corporation. An 'elasticity analysis' it undertook in 2009 showed that a 100 per cent increase would produce only a five per cent drop in ridership on the major routes and a one per cent drop system-wide, Deborah Marshall, director of Media Relations, said in an e-mail. More likely, a 10 per cent increase in major route fares would produce a 0.5 per cent drop. "This was not a survey," she says. "It was based on our actual data over the past ten years. We measured changes in price versus ridership numbers." The man who controls New Zealand's Fullers Ferries - Stagecoach founder Brian Souter - has made a personal investment of $20.2 million in an English luxury motor yacht manufacturer, Sunseeker International. Mr Souter's Stagecoach New Zealand bought into Fullers in 1998, and last year the company was taken over by Souter Holdings, which owns a number of other transport operations including urban bus operators Howick and Eastern Buses in Auckland and 74% of Mana Coachlines in Wellington, and Auckland ferry operator 360 Discovery Ltd.
Now the Scottish entrepreneur is investing heavily in British manufacturing. Nice to know and see where our overcharged fares are going. But sitting on the Jet Raider this morning because the Quickcat is clapped out for "unplanned maintenance" I'm not holding my breath those British boat manufacturers will turn out a new ferry for us soon. A report from the Transport & Industrial Relations Committee, which responds to the Campaign for Fair Ferry Fares petition (presented 2 July 2009) for an affordable and sustainable public transport system for Waiheke Island, has been criticised by C4FFF as failing to deal properly with the issues raised by the group, and the nearly 1000 people who signed it. The original petition, signed by 941 people, was referred to the committee on 2 July 2009. The committee also invited and received submissions from the New Zealand Transport Agency, the Auckland Regional Transport Authority (ARTA) and Fullers Groups. C4FFF said that report was 'disappointing', and that the real concern had not been addressed – that, given the fact there is no alternative route to the city, there is still no recognition of the need to regulate the fare structure and consult with the community board and users. "We are requesting a statutory mechanism of consultation, and this has not been addressed." C4FFF also disputed ARTA's conclusion that the bus fares were "far lower than they should be". It is very hard not be cynical when we need to take the word of government bodies on the true costs of services (rubbish springs to mind). We provided figures on the comparative costs of ferries and that it would be great to see the comparative costs of buses in Auckland and Waiheke, rather than an emotive statement that it costs a lot!, particularly as the buses are key to Waiheke's tourist infrastructure. C4FFF had worked out an approximate comparison as follows: "A $410,000 a year subsidy is just over $1,000 a day for a service that covers an area the size of most of mainland Auckland City. For example, a ticket from Britomart to Sandringham (22min ride) is comparable to Matiatia to Onetangi, and costs $3.30 compared to $4.10 on Waiheke." Many buses were currently travelling at capacity with Gold Card users, with locals often standing – but increased revenue for the bus company hasn’t resulted in any improvements in the service for locals in terms of frequency or access to remote areas. C4FFF also believes the committee did not address the implications of Fullers' ownership of the pontoons where its ferries dock at the downtown Auckland and Devonport wharves. These are placed on the only access to the dock, which means, in effect, Fullers can deny use to other potential providers. The pontoons should be classified as "infrastructure" and should be under public jurisdiction, even if they have been paid for by the ferry company. C4FFF saw the petition to the Transport Committee as a success as it made people aware that fare prices are arbitrary and over-inflated, and encouraged the community to question the cost of travel into the CBD and how fares are set. It is up to all ferry users to continue to remain vigilant in order to protest further price hikes. Last year C4FFF presented a petition to parliament regarding the Waiheke to Auckland ferry service. The ferry service provided by Fullers between downtown Auckland and Waiheke Island is registered with the Auckland Regional Transport Authority (ARTA) as a commercial public transport service as required under the Passenger Transport Management Act 2009. A registered service under the Act must provide to regional councils information on routes, timetables, and fares. Fullers must formally notify ARTA of any variation to any aspect of its services, including its fares. ARTA said that it has limited grounds for denying a fare variation on a commercial service, such as that operated by Fullers. It could do so only if the service in question unduly affected a contracted public transport service in Auckland, or was in breach of a control placed on it by ARTA. ARTA said that, as there are no contracted public transport services to Waiheke Island, these reasons did not apply in this case. Fullers’ management meets representatives of the Waiheke Island community monthly, through its Ferry Users Group. The rationale for any fare change is discussed with this group. Other ferry operators have provided competition on the Waiheke route in the past. Under ARTA’s Ferry Development Plan all infrastructure is required to be in public ownership to allow open access to wharves, subject to budget and commercial constraints such as lease arrangements. Auckland City Council owns all of the Waiheke ferry wharf infrastructure, which would therefore be open to access by other operators, but Fullers owns the pontoons where its ferries dock at the downtown Auckland and Devonport wharves. ARTA said that it subsidises the Waiheke bus service at about $410,000 per year; and it considers that Waiheke fares are especially low, far lower than they should be for the level of public transport service provided. The New Zealand Transport Agency suggests that since the current service provided by Fullers has existed for some years it appears to be sustainable. If the commercial operator notified ARTA that the service was to be discontinued, ARTA would need to consider whether a new commercial operator could register a service, or whether a contracted service was viable. ARTA has no plans at present to contract a service to Waiheke, and explained that the commercial service provided by Fullers offers a good service that appears to meet the primary needs of the market. However, ARTA said it could review its position if this were to change. We are satisfied with the explanations we have received regarding this petition, and have no other matters to bring to the attention of the House. The petition was referred to the committee on 2 July 2009. The committee invited and received submissions from the New Zealand Transport Agency, the Auckland Regional Transport Authority, Fullers Group, and the Campaign 4 Fair Ferry Fares. Off we went for a grand day out yesterday to Coromandel by 360 Discovery Ferries, a dinky boat braving the Hauraki Gulf, Tamaki Strait and Firth of Thames. $69 return from Orapiu to Coromandel town was not too excessive, especially it's far more scenic, and actually faster, than by car or coach. It seems to cater for tourists and locals alike, offering Coromandelites a fast-ish way to the big smoke and a timetable that allows for a good day out shopping. On the return trip it called in at Pakatoa and Rotoroa Islands, both off-limits to mere mortals. Just got txt flurries from Fullers announcing "unplanned maintenance" (Fullers speak for "the old girl clapped out again") of Superflyte with both Starflyte and Adventurer doing its runs tonight (Monday) and the next two days. Oh joy. Looks like even Jet Raider isn't up to it these days to do a replacement service - not that we're gagging for that anyway. I gave the Auckland Regional Transport Authority a piece of my mind on the various proposed smartcard systems for Auckland public transport. Join up to give your views too. I saw an announcement on the wall at Matiatia that the 40-ride tickets will get a time limit of 12 months' validity after purchase. The old style tickets will expire in March 2011. The reason given by Fullers is to make the tickets tamper-proof, although I have not heard of any incidents of people boarding with falsified 40-rides. This is just a fare increase by stealth as it will force occasional travellers (i.e. those making fewer than 40 trips a year) to buy an non-time limited 10 ride ticket, which is more expensive per ride. Oh, and calling it a "Flexi-pass" is a misnomer as it actually decreases flexibility. From Lynn: North Shore City commuters have always received better treatment from their council than Waihekeans have received from ACC. ACC received our fee park and ride facility on amalgamation. Then they charged us. Isthmus commuters have a choice of car or bus and sometimes even the train. Waihekeans have only the ferry and the bus routes are not extensive enough to cover all areas of the island. Carpool commuters leaving their cars for the day at stations for the Northern Busway and cross-harbour ferries can look forward to VIP treatment. The North Shore City Council is considering rewarding them with parking spots close to the Albany and Constellation Drive Busway Stations and the Bayswater and Devonport ferry terminals. Most weekdays, the 550 spaces at Albany and 360 at Constellation Drive are full from an early hour. Mayor Andrew Williams suggested parking spaces could go further if preferential parking were given to vehicles with two or three passengers. "We give an incentive of a better parking position and more certainty of getting a parking space," he said. But preferential treatment is not what Albany station user Rachel White seeks. She said yesterday she drove 5km to the station from her semi-rural home to catch the Northern Flyer across the harbour bridge to her city job. "It's a fantastic bus service ... my only gripe is that finding a park is getting worse. "The station park is full by 7.30am when it's not term break for the tertiary students. "Since the council opened bus lanes on Rose Elliott Ave in November, kerbside parking has been banned. "People park wherever they can and we are forced to walk 10 minutes to the station. "Yet you hardly see a bus come by and the road is so wide that the bus lanes are not essential at this stage. "Why can't kerbside parking be allowed again until more station parks are provided?" Mrs White said she was unable to carpool, and her area was not served by buses feeding the station. Busway stations manager Anthony Blom said the road was always marked for the lanes but kerb parking was allowed for about two years until it was needed for buses serving Albany Mall. Passenger transport manager Bill Drager said it was hoped to double the spaces available at the station by February. Albany was the busiest station, and park-and-ride facilities encouraged bus users who otherwise would drive to their destination. No date is set for introducing the preferential parking scheme. Motorists registering with the carpool would get a windscreen sticker. Security cameras would anyone using the sticker without the required number of passengers, which is still to be set. Campaign for Better Transport spokesman Cameron Pitches agreed with the move to reward people who made more efficient use of cars. He said the council could not keep on dedicating more land to car parking. At the Bayswater ferry terminal, the council hopes to settle a deal with the marina owners to lease the paid parking area, providing more convenient free parking for ferry customers. It will split the $5 parking fee with ferry operator Fullers and the Auckland Regional Transport Authority. In a commentary column for Bloomberg, Virgin Atlantic airline owner Sir Richard Branson takes a swipe at the proposals to merge the Atlantic routes of British and American Airways, which would result in a drastic reduction of competition on the routes. [...] the way the regulators deal with issues over the Atlantic -- the busiest air corridor in the world -- is the major focus of my attention. British Airways Plc and American Airlines’ proposed joint venture -- effectively a merger of their businesses on the world’s busiest long-haul routes -- is currently under evaluation by the authorities on both sides of the Atlantic. They have a duty to ensure consumers aren’t harmed by big businesses getting together to stitch up markets. It is very clear to me that regulators should be stopping BA-AA in its tracks. I have no doubt whatsoever that BA will use its exemption from competition laws and its overwhelming dominance to destroy competition, reduce choice and raise fares -- after all when has a monopoly ever led to lower prices? I don’t necessarily blame BA and AA as it is the job of their management to work in the interests of shareholders, not consumers. The competition authorities have a mandate to preserve competition and only approve deals that can provide tangible public benefits and demonstrate that these outweigh the risks to competition. A University of Portsmouth business student collected a national award at the Houses of Parliament after his successful campaign to slash the prices of Isle of Wight ferry fares for teenagers. Third-year student Paul Magee received a Seen and Heard award for his work on the Isle of Wight Youth Council. The awards recognise and reward the achievements of young people who have made a real difference to their own lives and the lives of others. When Paul realised that youngsters on the Isle of Wight were spending the majority of their pocket money on ferry fares he decided to take action. He contacted the two main ferry companies, Wight Link and Red Funnel, to fight for concessions for teenagers. But how high would you rate our chances to get a similar result here? Tertiary and other school students get a discount, but only during term time, not the holidays. The current system is really not comprehensive enough. Surely the $2 million Government gold card loot could be spread a bit more equally among all ferry passengers? This blog has now a Facebook page too. Just search for "Fullerswatch". Articles will be cross-posted so a non-Facebook audience can keep on participating. Here's a good idea from Paris and Tokyo: Ikea is dressing up metro stations to, apart from promoting its brand, show its furniture is really sturdy and hard-wearing as it can cope with the millions that could potentially use the seats. 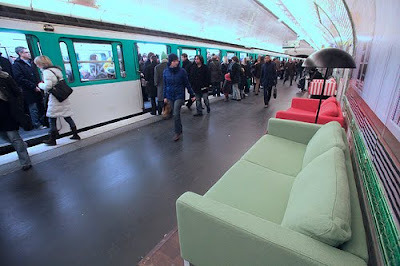 This would be an excellent idea for the local furniture emporiums to follow. Piers 1 and 2 are screaming out for a makeover because the recent terminal upgrades turned out to be draughty and cold disasters, and what were those designers thinking turning the toilet block into the Pier 2 focal point? Even Matiatia could do with a bit of a spruce up and turning into a lounge worthy of seafarers. Here's what Homebase (a British furniture and furnishings store) did with Carlisle train station. I love the lampshades! Links via London Underground blog. The ARTA is running an online panel survey group for people who use public transport, called From Go to Whoa. I would recommend you all sign up for it so they can hear a strong Waiheke voice, as they have been a bit deaf in the past. The Super Gold Card scheme for public transport that came in just before the 2008 election was a last gasp attempt by the NZ First Party to capture the oldies' vote, the party's core constituency. It was a rushed-through subsidy barely given any analysis on costs, take up, benefits and longer term effects on its budget sustainability. The $72m budget (over 4 years, $18m a year) is in danger of being overrun and isn't sustainable with its current funding. But under pressure from its beneficiaries, the Transport Minister, Steven Joyce, has now recoiled from making any changes to eligibility, subsidy levels or transport system coverage. The cost of high priced trips, such as the Fullers Waiheke ferry and the Wellington-Wairarapa train, is being blamed for the overrun. Fullers is said to have benefited by $2m alone for the tourist service it provides to the card holders. (It's barely used as a commuter card due to its invalid status during morning peaks). “The transport concession of the SuperGold card has an annual budget of $18 million dollars across the country – $2 million of that is currently spent on the Waiheke ferry alone,” says Mr Joyce. Cutting the Waiheke ferry and Wairarapa train services from the scheme affects its original intention of including all public transport in areas within the Auckland and Wellington Regional Councils to be eligible for the scheme. The only fudge that could be made is to re-classify the service as a tourist service instead of a public transport one. 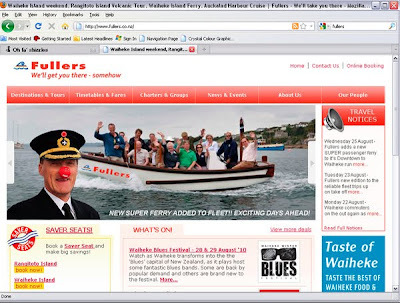 Fullers has long been redefining and repositioning the Waiheke ferry run as a tourist service than a public transport lifeline for islanders, including half page adverts in the newspapers and discounted online pre-booked fares for tourists. On that basis there is an argument to cut out the Waiheke ferry from the scheme: tourism susbidies go against the free market ethos of this government, and if Fullers gets the Government loot, why not the Interislander or the Pahia-Russell ferry service? The vociferous pensioner campaign to keep the scheme is not surprising, coming from a generation weaned on Government subsidies during their studying and working and now retirement lives. The mindset is one of entitlement and bugger the cost to current taxpayers and wage earners. It has led to a succession of unfunded liabilities in health, superannuation and now in public transport provision, liabilities expected to be borne by the current generation of workers (while paying monopoly rates for the Waiheke ferry service, the cost of their studies, accident compensation, unaffordable house prices and market rents). No wonder the proletariat is pissed off and doesn't care much about free pensioner travel. But again, the major scandal is still that the Government has failed to negotiate a bulk discounted rate for the Super gold card loot handed to transport providers, plus a requirement that the windfall profits should be shared with other fee paying passengers. Remember, as it stands now, the $2m raked in by Fullers is going straight to the bottom line because the revenue increase was achieved without a cent increase in costs: no extra sailings, new boats and extra staff have been needed during its record Summer this year. Councillor Denise Roche seems to be on the right track here. A friend hopped on the 8:15 from Auckland Sunday to come to the beach races. Fullers decided to wait until the boat had departed before notifying passengers of the tsunami and the beach races were postponed. Profit before people. Oral Submission to the Local Government (Auckland Law Reform) Bill, February 26, 2010, by the The Campaign for Fair Ferry Fares. We feel the No3 Bill enactment must include substantive clauses outlining legal obligations of the Council, CCOs, Business Units and Local Boards with a view to ensuring full and open transparency, and full democratic accountability to the people of Auckland. (This is consistent with the WICP position). We further believe that the CCOs need to have elected representatives, i.e. Councillors, who set policy and are accountable to the public. Alternatively, there needs to be a clear line of accountability to Auckland Council. The Council needs to be responsible for and set the priorities and policies of the CCOs and the budget, and the CCOs implement it, in the same way as other government departments work. An unelected CCO, with no accountability to the Council or the public is completely unacceptable. We want to see the Bill strengthened to ensure that the CCOs are transparent in the exercise of their responsibilities so that the ratepayer can retain control over public assets. For instance, the status of entities such as Ports of Auckland should not be subject to change without ratepayer approval. We completely disagree with the new Section 35I. The section provides for the minister of local government and the minister of transport, rather than elected local politicians to appoint initial directors of Auckland Transport. Handpicking political appointees to manage huge budgets is a recipe for corruption. There is a real danger that this process will also forward an anti-democratic, pro-business, privatisation agendas. In terms of Waiheke, the current model means that if wharf charges or ferry fares are arbitrarily increased, there is no public recourse. Moreover, the Auckland Council needs to set the priorities on what is spent on roads, versus public transport developments. The Bill needs to ensure that the TA is empowered to apply the integrated ticketing system comprehensively to all transport operators in the Auckland region, whether subsidised or not. We also need an affordability criteria and a look at standardising fares across the Auckland region: it shouldn’t cost as much to go 5 kms on Waiheke as it does to get from Auckland Central to Henderson. Transport Auckland should not be creating a profit, but as a public service provider, all revenue should be invested back into developing public transport including rail, buses and ferries. 15% of the Waiheke permanent population (approx 1000 people) commute regularly. The ferry provides a vital link to the city and that’s why we need some say in how integrated ticketing unfolds, and what powers the new Transport Auckland will have in regulating private transport operators, like Fullers ferries which operate without competition. The TA needs to ensure a level playing field to allow for potential competition, for example access to the wharves and equal access to public buses by different operators. The Waiheke Community Board should be integrated into all policy decisions affecting Waiheke Island because they have an understanding of the challenges and needs of the island community. These powers, functions and responsibilities should be defined in the Bill as recommended by the Royal Commission. The Local Board will be the only democratic voice for Waihekians since we will only have indirect representation on Auckland Council as we will lose our Councillor’s voice under the new system. First C4FFF meeting of the year, specifically about the issue of increasing bus fares. Saturday 20 February at 2pm. Contact Shirin at "findshirin [at] gmail dot com" for details. The New South Wales Government has announced a new fare structure for public transport meaning costs will be capped at $57 a week, for unlimited use of trains, buses and ferries. The new ticketing arrangements are known as My Zone, and apply to Sydney, the Blue Mountains, the Southern Highlands, Illawarra, the Central Coast, and the Hunter. The number of fare bands has been reduced in a bid to make public transport fairer and simpler. 90 per cent of fares will be the same or cheaper, and a new multiple use ticket means unlimited travel across the network will cost no more than $57 a week, except on the airport line. The price drops to $41 a week if only ferries and buses are used, however, two-thirds of ferry fares will go up in price. We need this also in place soon. A Sydney Morning Herald editorial on the issue here. Last night's 8.45pm ex-Auckland sailing on the Wanderer puttered all the way at half speed to North Head when the captain made a sudden 180 degree turnaround and started puttering back to town. No announcement from the bridge, nor the staff (probably too busy selling day-old fish curries - man, did that stuff stink up the cabin!). It took the effort of a passenger (Go, Nancy!) to find out from upstairs what the hell was going on and she relayed the bad news that the power basically had failed (hence the no audio on the ship's tannoy) and that we were on our way back to town. Then suddenly the engines kicked in at full force and they decided to make another 180 degree turn and continue to Waiheke. Only 20 minutes late. It was a serious dereliction of staff duty, I reckon, when they annoyingly and cloyingly announce at the start of each sailing that "you are to remain calm, seated and await instructions from your crew". If it had been a serious emergency, we would still be none the wiser. Fullers launched a new bus service on Waiheke, the Vineyard Hopper Bus, but the route and frequency are only aimed at tourists who don't want to drink and drive to and from vineyard tasting rooms and restaurants. It's of little use to locals wanting to get around by public transport. This remains still very much a challenge. An all-day pass on the Vineyard Hopper is $20, while on normal Waiheke buses it's $8. It says nowhere that there is integration between the services and tickets, so I hope Fullers makes it clear beforehand to passengers their $20 pass isn't valid on other buses or drivers should prepare for some irate (nay, even drunk irate) customers. And Supergold Cardies can't use theirs either. It looks very much all part of a plan to re-position Fullers as a tourism company instead of a public transport provider.